In today’s world, members of the same development team can manage complex projects, brainstorm during strategy meetings, and even share holiday celebrations -- all from across the globe. Nearly 70% of companies in the United States rely on global outsourcing to provide scalable and affordable growth. These distributed teams provide the benefit of varied experiences and perspectives, creating a diversity that allows companies to remain competitive as the industry evolves. Nearshoring development projects to nearby countries in Latin America allow companies access to talented teams for decreased costs. However, while global teamwork is more popular than ever, there are some struggles to be aware of when entering a nearshoring partnership. A good global team is mindful of the potential pitfalls, and takes steps to ensure a smooth campaign. Here are some common struggles globally distributed teams face, as well as some solutions for creating a successful development project. Here’s a nightmare scenario: You run an e-commerce site. It’s Black Friday, the biggest shopping day of the year, and your website just crashed. Your global development team in India is across the ocean--asleep. Time zone differences are a double-edged sword. On the one hand, it’s nice to have rotating teams, essentially allowing for 16 hours of productivity instead of just 8 hours. However, the time difference can leave a lull in communication, even if the message is urgent. Instead of offshoring to India or Eastern Europe, nearshore to Latin America. Countries in Latin America (LATAM) share time zones with the United States. Depending on your location, a LATAM team could be in the same time zone or, at most, just a few hours apart. This shared workday allows teams to work together in real-time, eliminating the struggle of different time zones. Likewise, LATAM countries share most major holidays with the US, so companies don’t need to worry about having half the team go on vacation for a holiday not celebrated by the US team. It also means both teams can celebrate holidays together, building a cultural camaraderie that leads to more successful, productive teams. Even when managing a team in the same building, messages can get garbled when passed from person-to-person. Typically, there’s a lot of back-and-forth between colleagues, clients, and management, and messages may come through multiple channels, such as email, telephone, or in-person meetings. It’s easy for an important message to get lost in the shuffle. When managing a global team, it’s all-the-more important to maintain a meticulously organized system of communication. First and foremost, it’s important for global teams to meet in-person. Typically, Innuy sends one or two developers to spend two weeks with our new nearshoring partners. 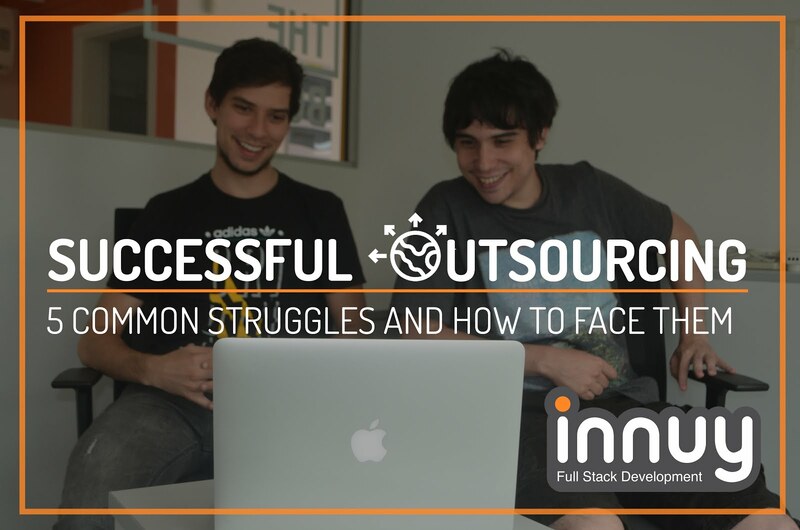 Spending time together, building bonds and connections, and learning about each other’s company culture is a valuable beginning for any outsourcing partnership. Using good communication tools, it’s very possible for distributed development teams to build work friendships, share in successes, and even build a combined work culture. We’d suggest using a tool like Slack, and then creating an exclusive channel for the entire distributed development team. Chat tools like this allow for instant communication; in fact, many companies who share the same office send digital messages to communicate with someone who’s sitting right next to them. Using a Slack channel, it’s easy to forget your colleagues are in another country! Inclusivity should be a core value for a diverse and distant team. Be sure to include your nearshore team in team celebrations, not just strategy meetings. Using a video tool like Google Hangouts, developers can feel immersed and included in the celebrations of their fellow teammates, even from far away! Innuy also encourages outsourced clients to, if possible, fly and visit their extended team in LATAM. The back-and-forth exchange strengthens communication and rapport between management and staff alike, building a strong foundation for project success. Organization is always important, but it’s especially important when working on complex development projects with global teams. While communication methods like Skype and Google Hangouts do allow for regular strategy meetings and updates, it’s still possible to lose track of goals, to miss a critical bug, or to simply have a staff member confused about what their next task is. Productivity is a valuable commodity, and there are tools and methodologies for protecting against productivity loss. Our experienced nearshoring development team has found that creating routine systems helps prevent productivity loss. We use a series of tools, and each tool is used for a clear and decisive purpose. Github will be used as the repository site. Jenkins will be used as the CI tool. Slack is used as our central daily communication tool. By specifying the purpose of each tool, and only using that tool for its intended purpose, important messages are far less likely to get lost. No staff member is confused about their next task, because each task is methodically recorded in the same, expected place. Another way of preventing productivity loss is by creating systems that provide autonomy. A Latin American developer may save you money, but are the savings really cost efficient if you lose valuable time waiting for updates, passwords, and information from the global team? An experienced development team will provide for the autonomy of their client. We suggest tactics like running the deploy script automatically, in order to keep the QA server up-to-date. This allows clients to test all tasks in Client Validation as soon as possible, without relying on their global team. Passwords and authorizations are kept in specific locations, where both teams can easily access them--thus, sparing the client from waiting for an email or phone authorization. Jenkins, Slack, and emails are integrated to ensure swift notification of communications, especially in case of website failure or bugs which need immediate attention. Managing expectations is vital for any development project. When it comes to outsourcing, sometimes different cultural phrasing can make setting expectations different. Descriptors like “quickly” or “very soon” may mean something different, depending on the country culture and even the work culture. Using very specific phrasing and employing careful communication can help decrease the chances of workflow confusion. In the initial engagement with our clients, we typically start with 1-2 engineers on a project so that our clients can see how we work and start to develop a comfort level before adding more developers to their team. Communication is vital to the success of the relationship, so a communication protocol is part of our workflow. It’s important to offer thorough and careful estimates during the proposal phase. We move forward in phases, adding features and functionality over time. We offer monthly one-on-one reviews with clients to discuss the quality and activity of the team members. We also utilize task diagrams and Agile methodology, so both teams have a visual understanding of their upcoming tasks, as well as any dependencies. Our teams move forward in two week sprints. These short bursts allow us to meet, review, strategize, and make any revisions in a timely manner. It prevents us from getting too deep into the project, then suddenly realizing there’s an issue. Both teams have access to a QA server, so developers and clients can test at any time during the process. To save even more time, our team tests automatically every time an update is made, to ensure the best quality of the application. Outsourcing development projects bolsters cultural exchange, diversity, and global talent--and on top of that, it saves money! Innuy delivers 100% team integration. Our engineers are available to fully participate in your staff's daily processes and progress reports based on your preferences. If your company has an upcoming web or mobile development project, it’s important to consider the benefits and struggles of working with a global company. The talented and experienced developers at Innuy recognize the potential stumbling blocks of outsourcing, and we’ve worked hard to minimize them and create smooth, seamless, and successful development projects. Latin America is one of the most popular places for North American nearshoring, due to our competitive costs and highly skilled developers. We believe in inclusivity, communication, and realistic goals. If you want to see our talent in action, take a look at our case studies to see the incredible results of our LATAM team.